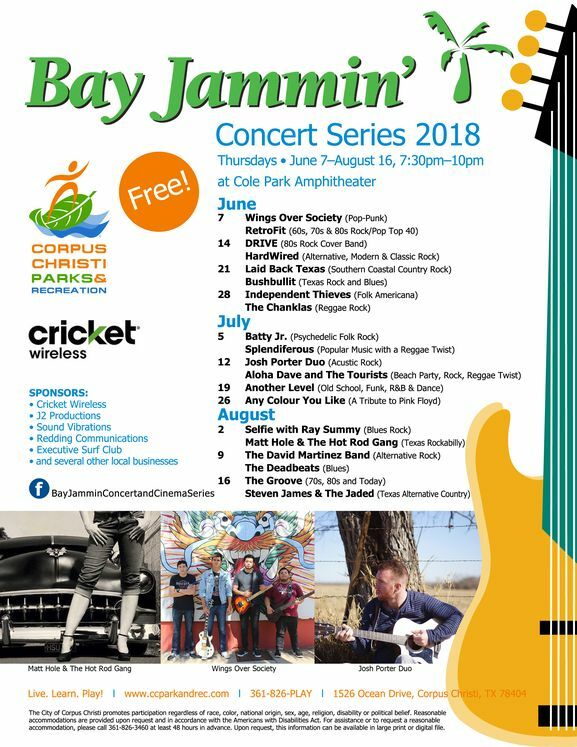 CORPUS CHRISTI, TX – Come experience the South Texas music scene during the 29th Annual Summer Bay Jammin’ Concert Series. The FREE series, which kicks off on June 7, will feature live band performances by favorites both local and across the state. Music lovers of all ages can experience a wide variety of genres including Alternative Rock, Country, Reggae, Jazz, R&B, and more. The Corpus Christi Parks & Recreation Department’s Cultural Services, Cricket Wireless, J² Productions, Redding Communications, Executive Surf Club, and many other local businesses invite you to take your seat under the stars to enjoy the weekly musical entertainment. Get your family and friends together and be sure to pack your lawn chair, snacks and a blanket. Most of all, don’t miss your chance to be part of a summer tradition that has had Corpus Christi jammin’ since 1989! Bay Jammin’ Concert Series will be held on Thursdays, June 7–August 16, from 7:30pm–10pm. For more information, visit www.ccparkandrec.com, download the flyer, “like” us on Facebook, or call (361) 826-PLAY. Reasonable accommodations are provided upon request and in accordance with the Americans with Disabilities Act. For assistance or to request a reasonable accommodation, please call (361) 826-3465 at least 48 hours in advance.